Deep orange color flowers, good aroma, high yielding, maturity 55-60 days from transplanting, good keeping quality. No annual is more cheerful or easier to grow than marigolds. These flowers are the spendthrifts among annuals, showing a wealth of gold, copper, and brass into our gardens. 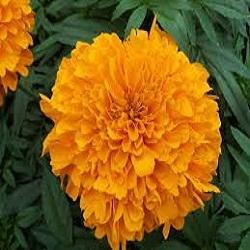 We present a mesmerizing range of Marigold Flowers for our invaluable clients. Available in bright yellow and orange colors, these flowers are suitable for making garlands and also be used for decorative purposes in religious places. We make sure to cut the leaves & ferns of these flowers carefully so that our clients receive a blossoming variety from us. We are engaged in the business of exporting a wide collection of marigold flower. Bright yellow and orange in color, these marigold flower are used to make garlands and to decorate the religious places. 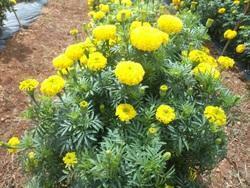 Marigold leaves are finely cut and fernlike before being supplied to the clients. Our clients can avail these at competitive prices.